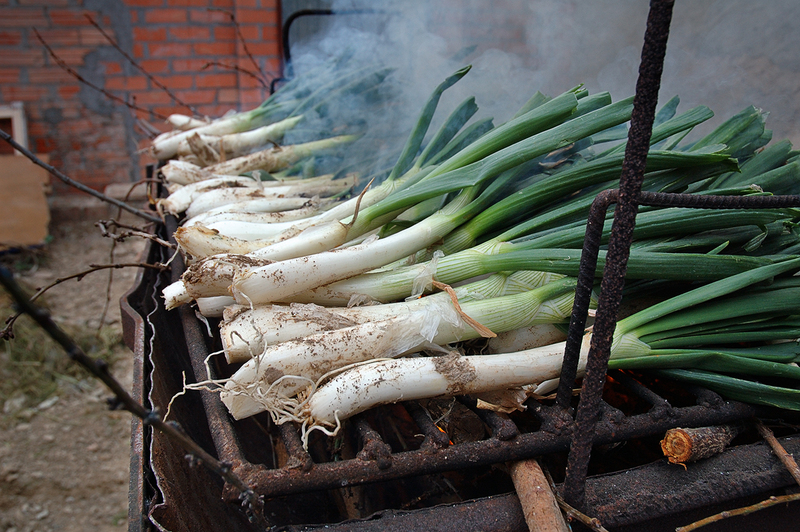 According to some sources calçots were first cultivated in XIX by a lonely peasant called Xat de Benaiges in Valls, Tarragona. In this close shot, you can appreciate the white bulbs that soon will turn completely black on the grill. Although they can be served on a roof tile, or a common plate, many times you simply pile them up in small amounts and wrap them in newspapers to keep them warm till served. They are quite tasteless, or better said, they taste like onions but without the biting feeling in your tongue. In fact, it is a very soft and delicate flavor that calls for a tasty sauce, in this case, romescu made of ground almonds and hazelnuts, vinegar, olive oil, salt, dry red peppers known as choriceros and paprika. Don't forget to use a bib to avoid the stains caused by the sauce and keep your fingers away from your clothes. Why so? Well, when you learn about the ritual you'll understand. First you spread the newspaper bundles on the table and everybody gathers around, usually standing with a bowl of sauce nearby. Now it's time to peel one of them. You take the plant by the leaves and pressing upon the tip of the white bulb with the other hand you try to pull away carefully the burnt out external layer. This you learn with practice. It must come out neatly without smashing the content. Then you leave the peel aside (now the hand used for peeling is a mess) and soak the bulb in the sauce, haul it towards your mouth and take a good bite only on the white part of the plant. The rest you throw away. After this repeat the process at will. Of course, wine is mandatory in this case. Maybe I have been too descriptive today but I have noticed in the past that calçotada details are too often overlooked. Bon appetite! Uso muito em meus pratos, chamo de alho porró? Bom demais até no feijão!! you have to eat calçots in Mas Boronat www.masboronat.es the place is sooo authentic, and the food is amazing... ;) strngly recommend it! Visit their web at restaurantfocibrasa.com we eat there this past weekend... Fabulous!